“True Color”, “Apparent Color”, “Adams-Nickerson”, “Biodegradable Colour” are all the same name for what we call ADMI Color (American Dye Manufacturer’s Institute). This metric is used to quantify the residual color of waste water due to the presence of colored minerals and dyes, humic breakdown substances and iron. The ADMI (American Dye Manufacturers’ Institute) Color Index was developed to monitor the color of wastewater effluent as an indicator of water quality. ADMI is a single metric based on the Adams Nickerson (ANLab) color difference between water and the visual Pt-Co liquid color standards that is independent of hue. “It has been estimated that annually up to 12% of the synthetic dyes used in textile manufacturing operations can be found in dye wastewater effluent. After being processed in treatment plants, 20% of those dye losses will enter the environment. The same mechanism that allows these colorants to bind so well with textile fibers also causes hydrolysis reactions with other wastewater components, or reduction in anaerobic sediments to produce obnoxious by-products. The Adams Nickerson Chromatic Value formula was an attempt to transform CIE tristimulus color space into a visually uniform color space through the use of a single metric color difference value. It is based on the premise that if two colors of different hues, A and B, are perceived to be visually different to the same degree from a colorless water reference point, then the vector distance (originally calculated as a ANLab delta E) from the colorless point to A or B will be the same in the Adams Nickerson color difference space. In the case of the ADMI scale, the APHA/Pt-Co liquid color standards serve as a set of physical reference standards against which the dye effluent is rated using a total color difference correlation. For example, if a blue dye effluent is visually perceived to differ from distilled water to the same magnitude as a light yellow APHA/Pt-Co 100 standard solution from the same colorless water standard, then the blue effluent is assigned an ADMI rating of 100. HunterLab has replaced this subjective visual judgment as to which APHA/Pt-Co standard solution the bluish effluent sample matches with an objective, colorimetric method using a dE* total color difference correlation to the APHA/Pt-Co liquid color standards. This correlation to assigns equivalent ADMI values to samples of textile wastewater effluent. Prior to measurement, the bluish effluent sample is filtered or centrifuged to remove suspended colloidal particles until judged to be visually clear. The samples are brought to room temperature. As the color varies with pH, the pH is adjusted to 7.6 using H2SO4 or NaOH as necessary. Or ColorQuest XE with EasyMatch QC in which the ADMI-10mm and ADMI-50mm metrics are standard under Indices. 13-8573-40 Transmission cell 10 mm cell or 13-8573-20 Transmission cell 50 mm. The HunterLab ColorQuest XT or XE sphere spectrophotometer is standardized in Total Transmission using a 10 mm or 50 mm cell filled with distilled water for low chroma liquid samples are being measured for ADMI-50mm color. If the waste water liquid is highly chromatic or dens, use the 10 mm cell and ADMI correlation. As a PQ – Performance Qualification step, measure back the water-filled cell as a Standard or Sample with an ADMI value of 0, within tight tolerances, being expected if the instrument is set up correctly and ready to measure. 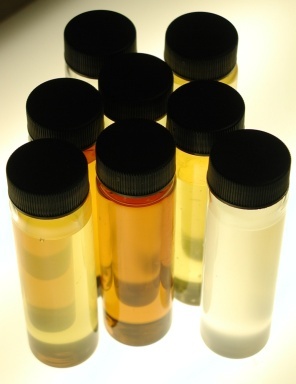 As a further PQ qualification, an APHA/Pt-Co/Hazen liquid color standard in the same ADMI range as the waste water samples can then be measured as an independent application diagnostic with an ADMI value expected that is equivalent to that assigned to the APHA/PtCo/Hazen liquid color standard. This can be tracked over time to verify long-term repeatability of the instrument in reading a stable, liquid sample similar in ADMI to the waste water being measured. Proceed to measure the ADMI Color of waste water samples. An ADMI value of 0 represents distilled water. A higher ADMI value indicates more dye or colorant in the waster effluent. From the literature references, the spectrophotometric correlation to the visual ADMI scale recommends use of a 10-mm path length cell for ADMI values greater than 250 and the use of a 50-mm path length cell for ADMI values less than 250. Think of it as using the 50 mm path length cell for low chroma; 10 mm for high chroma samples;. Both cell path lengths will work for the entire range, but if no path length preference is stated, use a 50-mm path length transmission cell for ADMI measurement. EPA Environmental Research Brief EPA/600/M-90-009, Reactive Dyes n the Aquatic Environment: A Case Study of Reactive Blue 19, United States Environmental Protection Agency, Environmental Research Laboratory, Athens GA USA (August, 1990). This visual yellowness color scale is based on a stable chloroplatinate solutions, best defined in ASTM D1209 Standard Test Method for Color of Clear Liquids (Platinum Cobalt Scale) with a corresponding instrumental APHA/Pt-Co method defined in ASTM D5386 Standard Test Method for Color of Liquids Using Tristimulus Colorimetry. This entry was posted in Chemical, Color and Appearance Theory and tagged Adams-Nickerson, ADMI Color, Apparent Color, Biodegradable Colour, True Color, waste water. Bookmark the permalink. ← What resources are available for making plaques and sheets from plastic pellets?